Doug Thompson is Kevin's father and the former captain and quarterback of the Lawndale Lions. These days, he works as a contractor ("The Daria Hunter") and professional bore. The teen players think he's cool, the teachers not so much, and his wife Charlene Thompson doesn't seem too keen on him either. 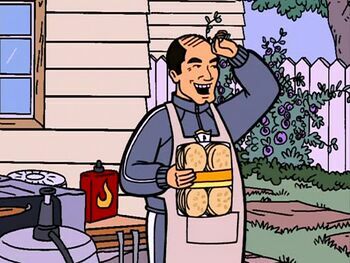 He was first depicted in "The Daria Database" before appearing in "Mart of Darkness", hosting the football team's barbeque - both sources make it clear he and Charlene had Kevin while still at school, which preys on her more than him ("I'm sure Kevin will be more careful than we were.") When he has to think about whether this could happen to Kevin, he puts the hypothetical blame on Brittany ("You think she's the opportunity gets knocked up type?") "Database" states he could have played football in college "if he hadn't failed his senior year and a checkpoint test". As far as he is concerned, Kevin plays football and nothing else matters, to the extent he pressured Mr. O'Neill into 'ensuring' Kevin didn't have to worry about those silly grade things ("Either pass the boy or get off my property!"). This led to Janet Barch beating him up. Earlier,on Kevin's website The Kev Zone, the quarterback says a failed game got his dad to pay Todd K. Feichmann to help him make the site: "My dad says I need a skill besides building can towers, because after last weekend's game he doesn't think we should count on that football scholarship." Kevin seems to love his dad but in his 2001 website, he refers to an imaginary friend called Sporty who hated his dad. "I miss Sporty."